When Only a True Black Acid Stain Will Do. 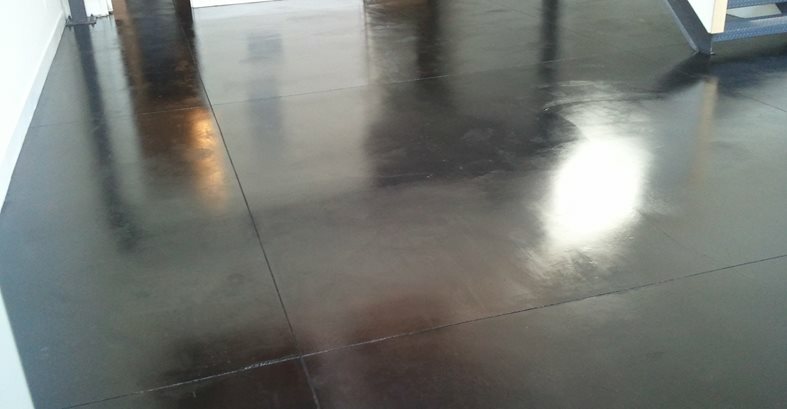 Several applications of Triple-S black acid stain, followed by a high-gloss sealer, produced this sleek black floor at the Gallery Lofts in Los Angeles. Black and gray stains, along with stencils, were used create a wave pattern in the floor at Sirena Seafood Eatery, Los Angeles. 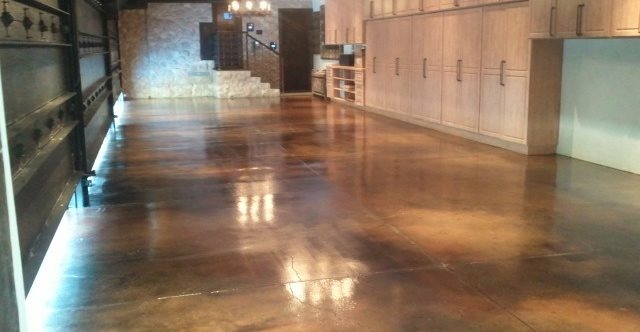 For this stained concrete floor in a six-car residential garage in Beverly Hills, Hapner used Triple-S acid stains in tan, sunset orange, and light and dark brown. First, he sprayed down light brown stain to cover the entire floor. When that dried, he applied the other colors, spraying them in different directions to create a random, natural look. The clients liked the floor so much, they decided to keep their cars parked on the driveway, says Hapner. Because acid stains for concrete tend to be translucent, one of the trickiest colors to work with is black. Even when you purchase a stain labeled as black, what you often end up with after applying it to the concrete is a very dark brown. On two recent flooring projects, Hapner relied on that true black color intensity, along with a few application tricks, to achieve the look each client was after. 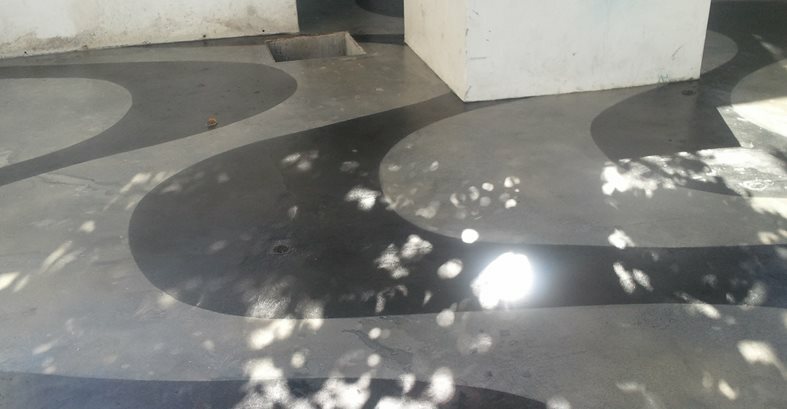 For the black floor at the Gallery Lofts in downtown Los Angeles, Hapner diluted Triple-S black acid stain with eight parts water and then misted it onto the floor with a sprayer, working in a diagonal direction from one side to the other. “Because the color has to ‘bake,’ or react with the limestone and calcium in the concrete, it takes longer for black to achieve its true color intensity, usually 24 hours after you apply it. Keep building it up until you reach the color you desire,” he says. For the second project, at Sirena Seafood Eatery on L.A.’s Beverly Blvd., Hapner used black stain to create waves on the floor to symbolize the restaurant’s mermaid theme. “The concrete floor was in terrible shape. We ground the inside and outside of the establishment, making the concrete smooth and opening the pores. We then prepped the floor by cleaning and etching to provide a good bond for the stain. We sprayed watered-down Triple-S black stain on the whole floor to achieve the base color. After 24 hours, we cut our stencils and set them down in a wave-like pattern over the whole floor.” While the stencils were down, Hapner applied several layers of gray stain (from Smith Paints), and then removed the stencils 24 hours later. Of course, Triple-S acid stains come in colors other than black (see this color chart). “In addition to our true black, our greens and blue greens and weathered copper offer a much more vibrant color than those of other companies,” says Simon Motamed of Triple-S, adding that the stains can be shipped anywhere in the country. “We have a very short lead time. If something is ordered before noon, we ship it out the same day,” he says. For more information, visit Triple-S Chemical Products (www.concrete-stains.com).